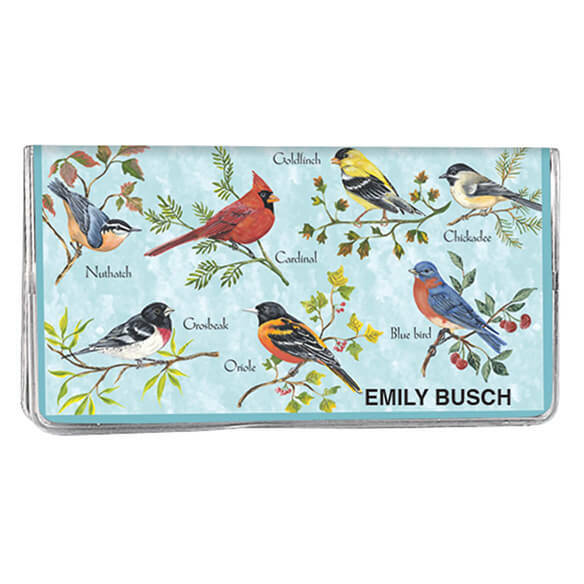 A beautiful way to keep a bird lover organized! Colorful songbird personalized 2-yr. planner features a monthly calendar with dates and holidays for 2 full years, with additional space for writing notes. Included bonus handy notepad helps you stay organized on the go. Personalize the 2 year planner's cover by specifying name up to 25 letters and spaces. Personal planner makes a great gift for friends and family! Plastic cover measures 6 3/4” x 3 5/8” when folded. Love my 2 Year Calendar! Actual use for business and Personal. Easier than fumbling for my cell phone! I buy these every two years from Walter Drake. They offer the best planner. I like the quality paper in the planner. It keeps me on track to avoid double booking my upcoming appointments. I have been reordering this planner for years. I also bought the address book. It inserts nicely into the planner and I never have to recopy addresses and phone numbers again. Paper erases easily with no smudging. Plastic cover holds up well during two years with only minimal cracking at the ends of the fold. For a 2-year planner, you can't beat the price. Have purchased "organizers" before and never been disappointed. I use this planner to record all appointments, events, travel, etc. I carry it in my purse as a convenient reference I can see at a glance.